Ideal for families, the Hotel Villa Tosi is a three-star family run hotel located in Igea Marina just a few steps from the sea. It offers a comfortable environment with internal parking, bicycles, playground areas and many services for children and families. We accept small and medium-sized pets. The hotel is located in Igea Marina on a quiet inner road close to the promenade and the beach. A couple of minutes on foot is enough to get to the sea. Not far from Bellaria train station. The area is full of restaurants, clubs and services. COMFORT: they have a balcony and a renovated bathroom with a shower and a hairdryer. They are located from the second to the fourth floor and served by a lift. DELUXE: they are on the first floor and can be reached by two flights of stairs. These are two triple rooms, both with private bathroom with window and shower. 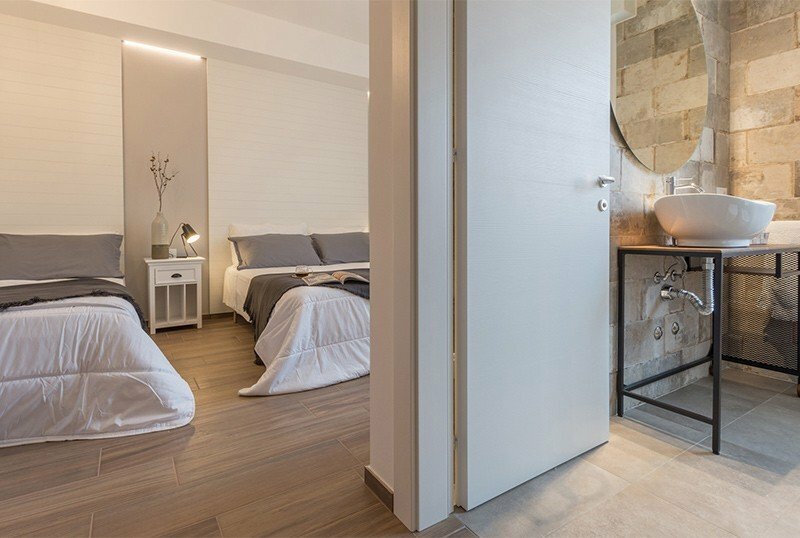 These rooms have the possibility to be put in communication with each other, giving life to a communicating family room, ideal for those who do not renounce to comfortable spaces and the right privacy. APARTMENTS : the hotel has two new apartments with terrace, double bedroom and living room with sofa bed (for 2 persons), kitchen with kitchenette, induction plate, oven and fridge. Outdoor area with chairs and tables, bicycles with seats available, hall with TV room, bar, reading room, elevator, internet point and luggage storage. PARKING: indoor and free, available for 7 covered parking spaces and 15 uncovered. PETS: small and medium-sized pets allowed both at the hotel and at the beah affiliated with the hotel. BREAKFAST: a sweet and savory buffet, with croissants, ring-shaped cake and homemade cakes, yogurt, cereals, eggs, cold cuts, cheeses and coffee and cappuccino expressed directly from the bar. LUNCH AND DINNER: you can choose between 3 different menus with Romagna and Mediterranean recipes based on meat and fish, buffet of vegetables and appetizers, fresh fruit and homemade ice cream. VARIATIONS: the kitchen is available to children and those suffering from intolerances or allergies to vary the dishes and prepare special menus. In the hotel: indoor playground area and bicycles with a seat. Paid: baby sitter. In the room: cribs with fall protection rails, cots, changing tables, bottle warmers and bath tubs. At meals: colored placemats, baby seats, baby cutlery and freshly prepared weaning pampas. On the beach: baby park, mini club and live entertainment. The hotel has an agreement with the nearby Bagno Gino n. 59-60 offering mini clubs, beach entertainment, workshops for children, sports tournaments, baby dance, games and activities for adults such as aquagym, muscle toning, tournaments and much more. Pedalos, canoes and mosconi are also available. The beach is equipped to accommodate pets. June (1 to 8 June) 1 child up to 12 years stays FREE and the 2nd child up to 12 years, pay half! The offers are valid for stays of at least 7 nights, for children in comfort room with 2 adults In the other periods of June, the children's discounts vary. Contact us for a personalized quote! - 1 child up to 12 years is FREE and the 2nd up to 12 years, pay half! For other periods, contact us and request a custom quote! August in All Inclusive: special offer! - 1 child up to 12 years stays FREE and the 2nd up to 12 years, pays half!